An IT Service Management (ITSM) capability based on the IT Infrastructure Library (ITIL) has served as the linchpin in modern IT shops. The role of ITSM is becoming critical as organizations consider adopting a hybrid-cloud approach combining on-premise enterprise assets with multiple cloud-based services (both private and public) accessed through many delivery channels, including mobile. While larger enterprises are seeing cloud services extend and enhance their ERP and large legacy system investments, managing the underlying technology requires an IT organization to have an enhanced service management discipline. Effectively applying ITIL processes and service management tools will enable organizations to transition both existing and new services to a hybrid-cloud delivery model while hiding the complicated integration, orchestration and rules management plumbing. 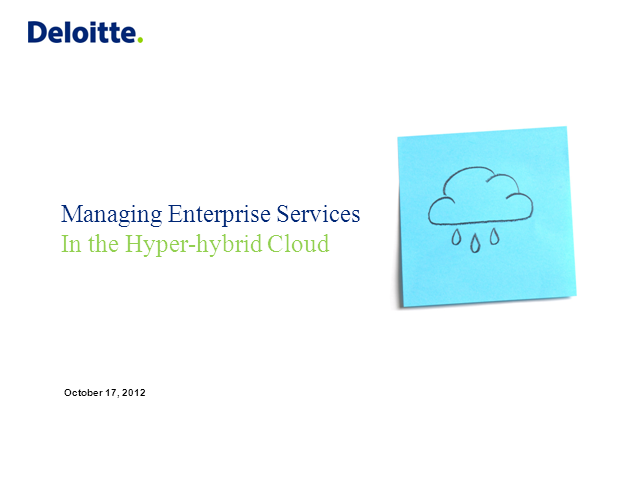 We will explore the operational implications for enterprises embarking into this more complicated hyper-hybrid cloud environment from a service management perspective across the ITIL lifecycle phases, including compelling case studies from start-ups fully built on the hyper-hybrid cloud, to enterprises across commercial and public-sector. Finally, we will provide an overview of the growing trends in the ITIL-based tools landscape being deployed to assist organizations in applying IT service management rigor and discipline across their all of their cloud services.